Teething is hard on the baby. It’s also hard on us mamas who are trying to build healthy sleep habits. When babies are in pain it’s hard for them to sleep, but it’s hard for them to cope with the pain if they’re exhausted! My oldest daughter (confident and take charge even as a baby) did not make a fuss about teething. After that, I never knew she was getting a tooth because she carried on like normal. She’d cut two teeth over lunch and nap like Rip Van Winkle in the afternoon. My next two children… not so much. There was drooling, crying, flailing, fussing, and exhaustion. If I didn’t do the things I’m going to talk about in this post, there was no sleeping to be had by anyone! Now, I recognize the Teething Fuss four rooms away and I am quick to do my part in easing this transition from tooth-under-gum to tooth-looks-like-mountain-peaks-with-valleys-of-skin to a free tooth. 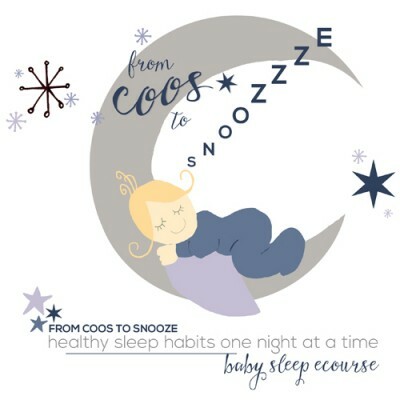 Here is how I navigate teething without creating entrenched sleep regressions. It should be expected and normal that babies have trouble sleeping when they’re in pain. Everyone has trouble sleeping when they’re in pain. However, teething can last a long time for each tooth and years before it’s all finished. So while you can expect some pain, fussiness, and difficulty sleeping, work through it as you go and don’t expect the worst. They will adjust and will get through it. There are many things on the market now to help relieve baby’s pain. 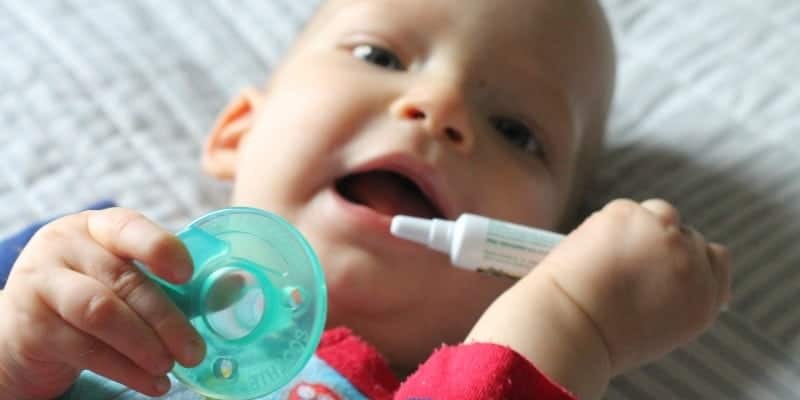 If the teething is particularly painful I like to give it before the nap as it’ll help them transition through active and passive sleep cycles without waking up because of the pain. I don’t change basic routines during teething. Mainly because teething lasts years. Years, people. If my baby or toddler has a hard time sleeping, I’ll move up their bedtime that evening by 30 minutes. I’ll also avoid activities that are overly stimulating since they will have a harder time sleeping. Depending on your baby’s age, a toddler may act as though they’re ready to stop napping. Never drop a nap while teething. If you stop putting your child down to nap – then realize they still need it – they might fight naps long after they’ve popped that tooth. We all want our babies to sleep well. I know, I write about this all the time. However, teething is not the time to start doing all the crazy tricks to get your little ones to sleep. Usually. If you see a tooth right under the surface and know it’ll cut in a day or two, that might work. But if you suspect teething and don’t see an actual tooth (meaning it’ll likely be weeks) don’t start the parlor tricks. You may need to rock until drowsy again, spend longer on the nap and bedtime wind down, and even give the pacifier throughout the night though they haven’t ever used it much before. However, if you find yourself doing this after more than a few days, I’d amp up the pain relief, and stop the sleep tricks. 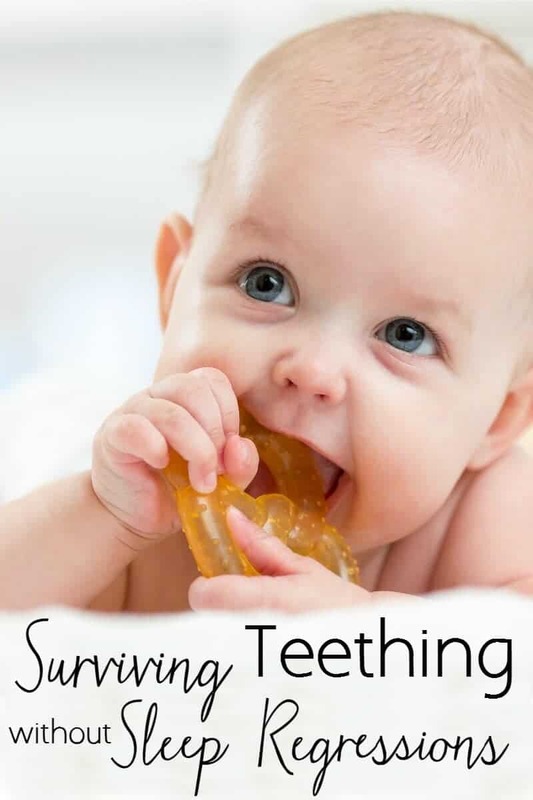 Since teething lasts for so long, they will get used to the sensation, and the fewer changes you make the better. Now, when a baby is in pain it’s hard to sleep. The harder it is to sleep the less they sleep. The less they sleep the more tired they get. Wow. Teething is so much fun it’s like taxes. By the time you’ve finished with them, it’s time to start again. Though you don’t want to create entrenched bad habits nor change your routine too drastically to accommodate teething, we should do our best to prevent overtiredness. Whether it’s moving naptime or bedtime up 30 minutes or letting baby go to sleep in the car once in a while, try to make sure they are still getting good chunks of sleep or the pain will be even harder to take. Frozen grapes in one of those mesh baby food things. Thank you for the wonderful post Rachel… What if your baby is 3 months / 13 weeks and the only way now they go to sleep is in a sling? Even after painkillers some bouncing, winding down… Even after an hour and 20 she’s still eating her hand off crying miserably wanting to just sleep in the sling? Oh sweet girl, well my motto has been try my best to prevent bad habits and, when it gets bad, just do what it takes to help the baby sleep. Hvaing them well rested is better than trying to follow strict rules. That poor thing!